Heat the olive oil in a sauté pan and cook the onion for 2-3 minutes until soft and pale gold in colour. Stir in the chilli and sauté for another minute. Pour in the basmati rice and stir briefly to coat in the oily juices. Mix the stock with the orange juice, seasoning and apricots then pour over the rice. Bring just to the boil, turn down to a simmer, then cover the pan and cook for 20 minutes until the liquid has been absorbed and the rice is tender. Don't stir the rice during this time. Season. 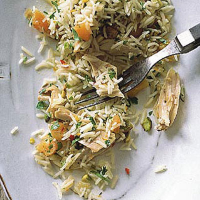 When the rice is cooked, gently fork the chicken into the pilaff along with the parsley, orange zest and nuts. Cook for 1-2 minutes, stirring constantly, until the chicken is heated through. Serve with a dollop of Greek yogurt on the side.